My LightWave 3D LScript Package for Sublime Text 2 is now available at GitHub. 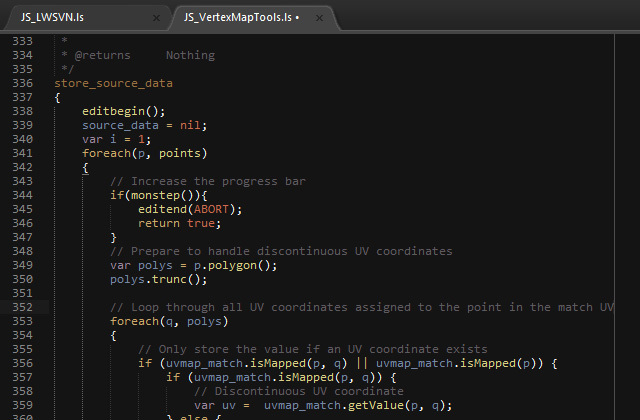 Sublime Text 2 is since some time my favorite code editor. I use it for everything these days, from Python and Amiga assembler to the code for this website. It’s polished, it’s elegant, and its API is dead easy to use for extending Sublime with custom functionality. I’m that geeky that I still fall in love with simple but beautiful applications. Anyway, back to the subject, even though we are now getting a very robust and awesome Python implementation in LightWave 3D eleven, that goes above and beyond what we ever could do with LScript, I’ll probably still dabble around in LScript from time to time. At least when doing quick adjustments to older scripts that I don’t currently see any point in spending time to rewrite in Python. So I’ve made my LScript Package that I created for Sublime Text some time ago available at GitHub for sharing. And by that also open it up for anyone else to add to and improve upon using GitHub’s social collaboration features for coding. So if you’re into LScript, and have wanted to give Sublime Text a spin, go ahead and grab my LScript package for it. Oh, and one more thing, by the time LightWave 3D eleven hits the shelves, I’ll get a lwsdk Python package for Sublime Text going.